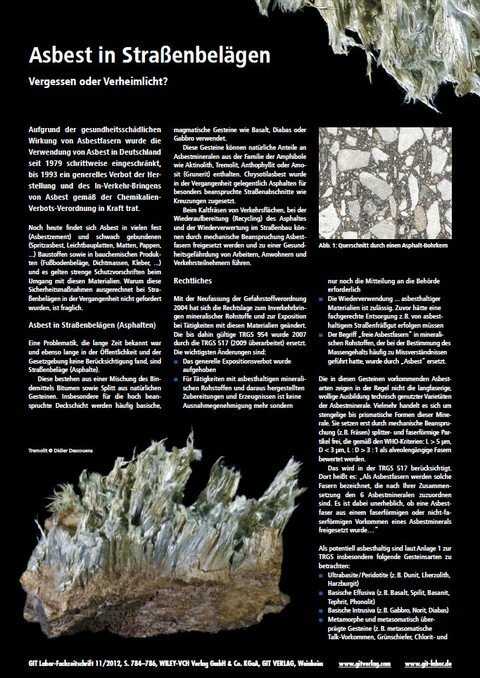 This small article was the basis of two publications in the GIT Labor-Fachzeitschrift 11/2012 (in German) and the Mitteilungen des Berufsverbands Deutscher Geowissenschaftler, BDG, 120, Ausgabe 01/13 as well as the basis for a Wikipedia article entitled "Asbest in Asphaltfahrbahnbelägen" (in German) which has been revised many times in the meantime. Due to the harmful effects of asbestos fibres on health, the use of asbestos in Germany has been gradually restricted since 1979, until 1993 when a general ban on the manufacture and marketing of asbestos came into force under the Chemicals Prohibition Regulation. Asbestos is still found today in many solid (asbestos cement) and weakly bonded (sprayed asbestos, lightweight boards, mats, cardboard, ...) building materials as well as in construction chemical products (floor coverings, sealants, adhesives, ...) and strict protective regulations apply when handling these materials. Road surfaces (asphalt) are a problem that has been known for a long time and has not been taken into account by the public or by legislation for just as long. These consist of a mixture of bitumen binder and natural stone chippings. Basic, magmatic rocks such as basalt, diabase or gabbro are frequently used for the highly stressed surface course in particular. These rocks may contain natural parts of asbestos minerals from the amphibole family such as actinolite, tremolite, anthophyllite or amosite (Grunerite). 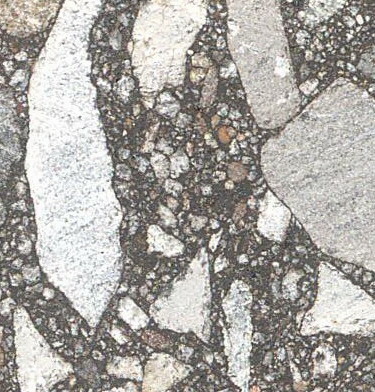 In the past, chrysotile asbestos was occasionally added to asphalts for road sections subject to heavy traffic, such as crossings. 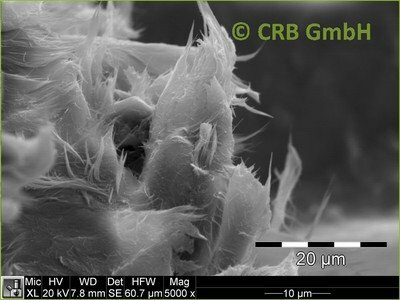 Asbestos fibres can be released during cold milling of traffic areas, during recycling of asphalt and during road construction and can lead to health hazards for workers, residents and road users. Activities involving mineral raw materials containing asbestos and preparations and articles derived therefrom will no longer require a derogation but only notification to the Authority. The types of asbestos found in these rocks generally do not show the long-fibred, woolly formation of technically used varieties of asbestos minerals. Rather, they are stem-shaped to prismatic forms of these minerals. They only release splinter- and fibrous particles through mechanical stress (e.g. milling), which are classified according to the WHO criteria: L > 5µm, D < 3µm, L : D > 3 : 1 are evaluated as alveolar fibres. This is considered in TRGS 517. There it says: 'Asbestos fibres are those fibres which are classified as 6 asbestos minerals according to their composition. It is irrelevant whether an asbestos fibre was released from a fibrous or non-fibrous occurrence of an asbestos mineral...'. ... the employer shall assume that no asbestos is present during the extraction, processing, re-processing, further processing and recycling of mineral raw materials from rocks not listed in Appendix 1. ... The employer can assume that the mass content of asbestos in mineral raw materials, such as those found in quarries in the Federal Republic of Germany, for example, is less than 0.1 per cent, so that the ban on manufacture and use in accordance with § 18 in conjunction with § 18 of the German Chemicals Ordinance is not applicable. Annex IV No. 1 para. 2 subpara. 3 Hazardous Substances Ordinance is not affected. This assumption is wrong! Numerous investigations of the chippings fractions of asphalts have shown that WHO fibre concentrations >0.1 %, total fibre concentrations >0.5 % and total asbestos contents (fibrous and non-fibrous particles) in the range of several percentage points can occur in places, especially in gabbros and norites. The content of respirable asbestos (WHO) fibres must be determined in chippings from rocks classified as potentially containing asbestos in accordance with TRGS 517. In this complex process, the asphalt samples, most of which are in the form of drill cores, are broken and homogenised, and the bitumen/tar content is extracted by annealing or dissolving. 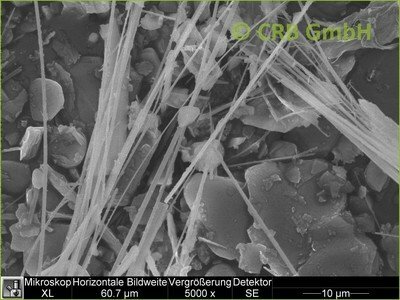 The material is then ground to grain sizes < 100 µm and a partial quantity of the sample powder is converted into distilled water. Water suspended. The water is filtered and the filter is examined by scanning electron microscopy / X-ray microanalysis. With a high detection sensitivity of 0.008%, low asbestos contents can be determined. If the (WHO) asbestos fibre concentration is > 0.008 %, appropriate protective measures must be taken when handling the material. 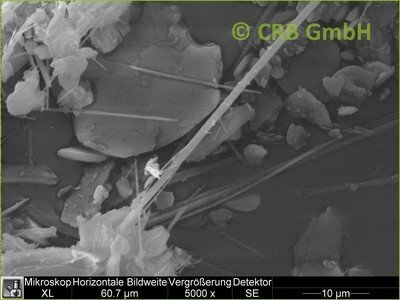 If the total asbestos fibre concentration is > 0.1 %, the use of the material is prohibited by the GefStoffV and the material must be disposed of. The way this problem is dealt with varies from one federal state to another. At present only in Lower Saxony, partly also in Hamburg and Schleswig Holstein, is asphalt tested according to TRGS 517 / IFA / BIA 7487. In other federal states (e.g. NRW), it is generally assumed that asphalt may contain asbestos and protective measures are taken, e.g. when milling traffic areas (extraction, hot and wet milling). There is no information available from most federal states on the handling of TRGS 517 in road construction. There is certainly a need for action to standardize the implementation of the valid legal requirements nationwide. The question also arises as to whether it makes sense to continue mining rocks, such as gabbros, whose hazard potential is sufficiently known, and to process them into chippings. And what about the railway's track network, in which the track beds are predominantly 'ballasted' with basalt?